When Gwen Stacy(one of parker's true loves) died,Spider-Man describes himself as feeling "blue". This style is only designed for spider-man when he feel blue. 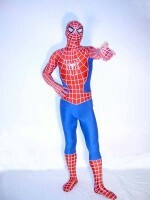 this Spiderman Costume with lycra spandex material adopted,the suit is classic spiderman blue and black colored. 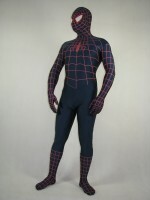 the spider and spider line is black.the eyes of the suit are made with corespun. Color: Black & Blue Pattern: Yes Fabric: Lycra/spandex Surface: Matte Eyes: coresp..
this Spiderman Costume with lycra spandex material adopted,the suit is Blue And Purple colored.the spider and spider line are black.eyes are made with corespun can see out well.only the front has the spider,if you want both siper please choose the most new style. 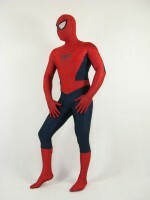 Color: Purple & Blue Pa..
A red spandex spiderman costume with lycra spandex material adopted, the suit is the red spider patten on the blue spandex suit. it is use the Pattern skill.on the back there has no spider. Color: blue & red Pattern: Yes Fabric: Lycra/spandex Surface: Matte Eyes: corespun..
this Spiderman Costume with lycra spandex material adopted,the color of this spiderman is blue and white. the spider and spider line is white.eyes are made with corespun.zipper is on the back. 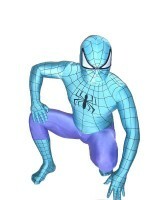 Color: White & Blue Pattern: Yes Fabric: Lycra/spandex Surface: Matte Eyes: corespu..
A Spiderman Costume with lycra spandex material adopted,the suit is deep blue and white colored. 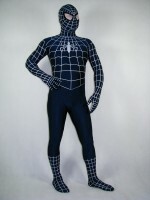 the spider line is white,the body suit is blue color.eyes is made with corespun.full body design but you can choose the hood attached seperate Color: Black & white Pattern: Yes Fabric..
Cosmic Spider-Man Halloween Costume Cosmic SpiderMan Suit is a best halloween costume,it'spattern looks like the sky and stars. very amazing.it's made of lycra spandex which have good elastic and comfortable. ..
the full body covering Spiderman Superhero Costume zentai suit with lycra material adopted,the zentai suit is blue and yellow colored. spider stripe is yellow color. eyes are made with white lycra material. Color: blue & yellow Pattern: Yes Fabric: Lycra/spandex Surface: Matte ..
A full body covering zentai suit with metallic material adopted,the zentai suit is white and blue colored. it's the open mouth style spiderman.the siper on the front is very big than normal. and eyes are silver material,but can't see out. on the back there has no siper,but we can add for ..
Spider-Girl Costume Mayday Parker Blue Black Spider Suit This Spider-Girl Costume is Blue Black Color with 3D Shadow, Looks very Amazing! It's the Best Halloween Costume for Female. ..
Spider-man 2099 Suit Halloween Spiderman Costume This Spider-man 2099 costume use heat transfer printing with 3D shadow. and it's the best costume for halloween, looks very cool, just like the character in the comics. .. The Amazing Spider-man Costume The Amazing Spider-man 3D Original Movie Costume is the best costume for any event, useing heat tranfer printing, looks very look, just like the spiderman in the movie. and it's made of lycra spandex, very comfortable. ..